In Martinique, this dependence is made for lovers of perfection (couple or Chef d'Entreprise). A haven where you can, as you relax by the pool facing beautiful vegetation without vis-à-vis. Spacious, with a nice design, air-conditioned addiction can comfortably accommodate 2 people next to a beautiful hut with reference to tradition. Home Away........Is it possible to give a higher rating of 5 stars? We have travelled all over the world, and stayed at more than a dozen Home Away locations. We arrived to Martinique as adventure travelers for the New Year Holiday, we left feeling like a member of Liliane and Thierry's extended family. Liliane and Thierry are THE most humble, fun loving, and inviting hosts we have EVER had the pleasure of meeting and staying with. You can feel the love Liliane and Thierry put into the property and you feel the love they give when you stay. We absolutely enjoyed ourselves and will be staying again. Maison loin........ Est-il possible de donner une note plus élevée de 5 étoiles? Nous avons voyagé partout dans le monde, et nous avons séjourné dans plus d'une douzaine d'endroits à la maison loin. Nous sommes arrivés à la Martinique en tant que voyageurs d'aventure pour les vacances du nouvel an, nous avons quitté le sentiment comme un membre de la famille élargie de liliane et Thierry. Liliane et Thierry sont les hôtes les plus humbles, amusants et accueillants que nous ayons jamais eu le plaisir de rencontrer et de rester avec. Vous pouvez sentir l'amour que Liliane et Thierry ont mis dans la propriété et vous vous sentez l'amour qu'ils donnent quand vous séjournez. Nous avons absolument apprécié nous-mêmes et nous y retournerons. Vous êtes les bienvenus pour partager d'autres bons moments ensembles "comme à la maison"
This was my and my husband's first time in Martinique. We could not have had better ambassadors than Liliane and Thierry or a better place to stay. The room and surrounding areas (outdoor living space and pool) were beautiful reflections of the island itself. We thoroughly enjoyed our time and I would highly recommend. I must say also that while I was staying I had a personal emergency and I will always be grateful for the kindness and generosity Liliane and Thierry showed us. Les vacances seront toujours un souvenir très spécial pour moi. Chaque rencontre est une aventure, nous gardons de vous, Gina et Tyrone, un excellent souvenir qui reste inachevé. Nous espérons vous revoir afin de partager d'autres bons moments. Great location, high in the hills, center of the island. Great hosts! First trip to Martinique - amazing place - compared to much of the Caribbean it's almost untouched by tourism! Liliane and Thierry are great hosts, offered us help to find anything! Navigation, restaurant recommendations, tourism points of interest and more. We arrived late on a Sunday evening (many restaurants are closed on Sundays!) so Liliane said "follow me" and she drove to a city hotel with a full restaurant service where we had dinner. It's a great location, separate from the main house, it's a nice room for two, en suite bathroom - and because of the climate the living room and kitchen are outside in a covered patio. Really quiet, relaxed, we chose it because it was NOT a beach location - more a central location from which we could explore. So we explored the island, ate "at home" a couple of nights, ate out at fabulous restaurants for a few too. Lunch anywhere French is excellent french bread with pates and cheeses.....HEAVEN!! Thierry also has a powerboat tours business - so one day we spent the whole day aboard - touring islands, swimming, snorkeling, and an impromptu beach grill with cocktails and wines! We stayed Feb 12 - 19, 2017. So we highly recommend this location - and enjoyed the hosts - thank you!! We also appreciated your visit and your company. We are glad you enjoyed the stay. It was a great meeting despite the language barrier, we speak the language of the heart. Yours to the whole family. Une bonne adresse: chambre agréable et climatisée, jolie douche et grande pièce à vivre confortable avec vue sur la piscine et la « jungle ». Pas très pratique pour rentrer la voiture dans le jardin mais aucun problème pour se garer tranquillement dans la petite rue. Je recommande pour une position centrale en Martinique. Très près de l’aéroport mais sans aucune nuisance, très calme . Merci à Liliane et Thierry pour cet accueil chaleureux dans votre coin de paradis. Nous avons passé une excellente semaine, Liliane et Thierry sont très accueillants et disponibles. La chambre est agréable, bien équipée et bien climatisée. 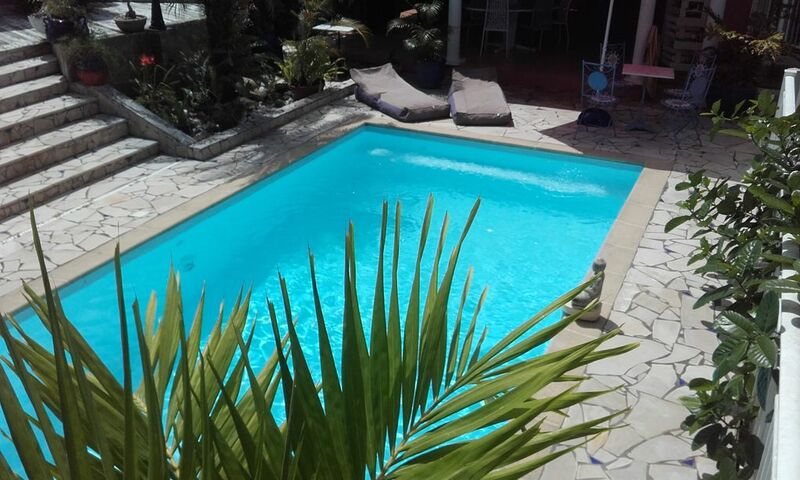 Le carbet devant la piscine est une vraie pièce de vie ouverte sur un beau jardin. Merci encore, nous reviendrons avec plaisir.